N115WF 1994 Challenger 601-3R based Toluca (Mexico City) missed approach reporting a tailwind of 33 knots, Lear 45 and Falcon that landed in front of N115WF both reported low level wind shear with winds from -10 knots to +20 2 miles to final. Landing on runway 15 aircraft landed hard and lost directional control and flipped - runway braking was reported as good, winds 330 at 16 gusts to 25. Reported as 3 on board, 1 fatal (Co-pilot), 1 severely injured, 1 non-life threatening injury - confirmed as 3 male pilots arriving to pick up returning passengers to Mexico City. 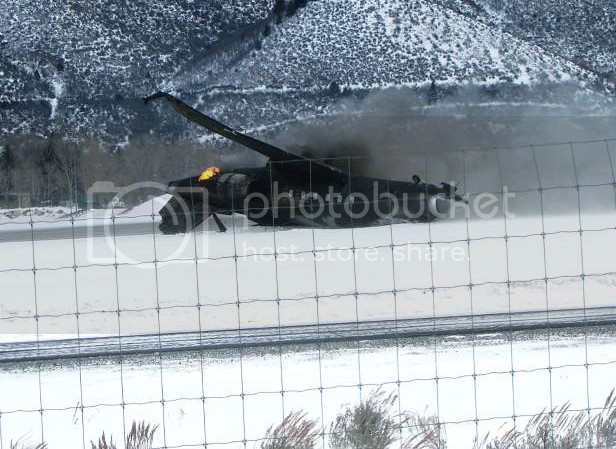 Unconfirmed - mixed reports - aircraft sounds like it crashed into the runway, losing starboard wing near 'touchdown' point, and burst into flames on contact with the runway, aircraft went off the right side of the runway and flipped upside down. 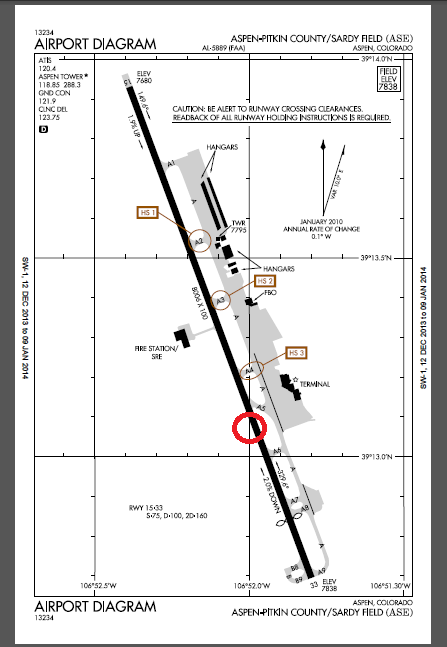 Landed Runway 15, wreckage location marked by red circle. Preliminary should be out in about 10 days, airport is still closed until tomorrow, though they did let a few jets depart today (no arrivals). Both pilots flying, were retired Mexicana Line Captains. Airport opened to traffic this morning . . . after wreckage was removed. Passenger reportedly was able to walk to the stretcher. 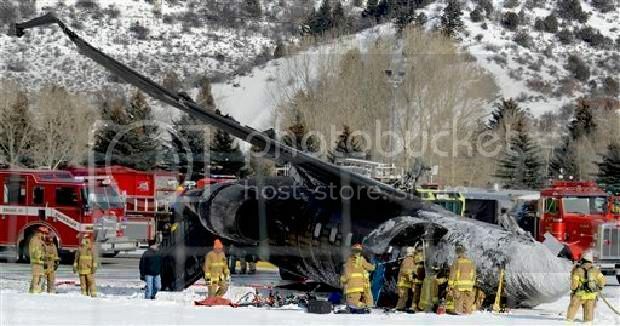 On January 5, 2014, at 1222 mountain standard time, a Bombardier CL-600-2B16, N115WF, impacted the runway while attempting to land on Runway 15 at Aspen-Pitkin County Airport/Sardy Field (KASE), Aspen, Colorado. There were two crewmembers and a passenger onboard. One crewmember was fatally injured; the other crewmember and passenger received serious injuries. The airplane was destroyed. The airplane was registered to the Bank of Utah Trustee and operated by Vineland Corporation Company, Panama, South America under the provisions of 14 Code of Federal Regulations Part 91. Visual meteorological conditions prevailed for the flight, which operated on an instrument flight rules flight plan. The flight originated from Tucson International Airport (KTUS), Tucson, Arizona, at 1004. According to preliminary information from the Federal Aviation Administration, the flight was in radio contact with ASE air traffic control (ATC). At 1210, N115WF utilized the localizer DME-E approach into KASE. ASE ATC reported winds as 290º at 19 knots, with winds gusting to 25 knots to the crew before landing. The crew executed a missed approach, and then requested to be vectored for a second attempt. On the second landing attempt N115WF briefly touched down on the runway, then bounced into the air and descended rapidly impacting with the ground at midfield. No further communications were received by ASE ATC from the accident airplane. At 1220, the KASE automated surface observation system (ASOS) reported the following weather conditions: wind from 320° true at 14 knots gusting to 25 knots, wind variable from 280° to 360, visibility 10 miles in haze, scattered clouds at 4,700 feet above ground level, ceiling broken at 6,000 feet, temperature -12° Celsius (C), dew point temperature -21° C, altimeter 30.07 inches of mercury. The remarks indicated a peak wind from 320° at 26 knots occurred at 1204. The KASE ASOS one-minute data at the time of the accident reported the wind at 333º true at 14 knots gusting to 17 knots. The cockpit voice recorder, flight data recorder, and Enhanced Ground Proximity System were recovered. - Three pilots on the plane. Because on the news they keep saying 2 pilots and a FA. Wrong!. - One pilot was being trained. The aircraft had a new owner. - The trip was made to pick up some relatives and friends of the pilots. Actually if you google FSMEX.com and click on translate, the entire site is in English. Just to confirm - information you posted is incorrect - the deceased pilot was also a Captain who was sitting in the co-pilot seat = his name was Captain Sergio Emilio Carranza Brabata, 54. The person you posted as Miguel Henriqez is not deceased, he remains in critical condition in Colorado - he was the Captain flying the aircraft. The passenger Moises Carranza was interviewed by NTSB and was released from the hospital in Colorado, and returned to Mexico. NTSB said his interview will be included in the final reported estimated to be released in 18 months. If you read again my post slowly, you´ll see that we are both saying the same thing. Crew names: 1) Cap. Moisés A. Carranza. MXA pilot since 1982. One year of experience on type. I did not use their full names to make it easier for you. And if Miguel was flying the plane there´s something wrong here. People who know them are saying he was not supposed to be flying it. I wouldn't use google to translate text from a forum. Many things get lost in translation due to expressions, slangs, typos, etc. No problem, I read it as 'The only casualty Miguel A. Henríquez'. The blowing snow really shows that tail wind! 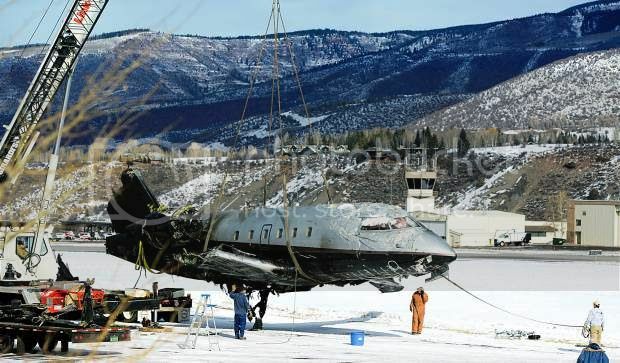 The NTSB has determined that wind conditions and an unstabilized approach were key factors in the Jan. 2, 2014 fatal crash of a Bombardier Challenger 601-3R that was attempting its second landing after a go-around at Aspen-Pitkin County Airport in Colorado. One pilot was killed and the other pilot and passenger (who was occupying the cockpit jumpseat) were seriously injured. The Safety Board concluded that the weather at the time of the accident “was near or in exceedance of the aircraft’s maximum tailwind and crosswind component for landing.” Day VMC prevailed for the Part 91 flight. The factual report says that the initial part of the approach was as expected for descent angle, flap setting and spoilers. During the final minute of flight, however, the crew advanced and pulled back the power five times between N1 speeds of 30 percent and 75 percent and airspeed varied between 135 knots and 150 knots. The aircraft stayed nose down during its final descent and initial contact with the runway. It pitched up above the runway for several seconds before a hard runway strike, a gain in altitude “and a final six-g impact onto the runway. The final portion of the approach was not consistent with a stabilized approach,” the report concluded. Both the pilot and copilot (who was not Challenger rated) had logged relatively little flying time in the aircraft type and had never flown into Aspen." You have to have been trained to go to Aspen, it's right on the plate as I recall. Sad story, guess I can't use this gong show to illustrate the use of rudder in a crosswind. xsbank wrote: You have to have been trained to go to Aspen, it's right on the plate as I recall. There is a special training required to use the LOC/DME 15 IFR approach. 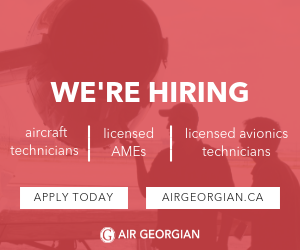 It actually requires the company, crew and aircraft to be authorized and approved by the FAA. The published approaches are all circling approaches and require 3sm vis and gets you down to 2000' AGL and do not require any official training. My understanding from talking to instructors at the training centre where these guys did their initial at was that they were strongly encouraged to hire an experienced challenger pilot for the first couple of months. They followed this advice for the delivery flight from fll to Toluca, then requested an instructor from said training facility for the Aspen trip. One of the instructors agreed to it provided he was left seat for the Aspen leg and then declined when he was told he'd be jumpseat for all legs. I've only taken a 601 into Aspen a few times, but I've seen enough to know that even as a training captain with 3000hrs on type I'd never have left the IF on that day. High elevation, a 6.6 degree descent if you fly the profile from the FAF to the runway, and a long, narrow, upsloping runway that gives an illusion of being even higher on the approach than you are make you earn your paycheck even on a good day. Attempting it with 30-40 knots on your tail as your third landing in the airplane ever?? Well, you can draw your own conclusions on how that one was going to play out. Oh, it is 100% impossible for the 601 to squeeze in the 'c' category for circling up there so it's illegal to shoot any of the public approaches. As another poster mentioned the only straight in approach is restricted, requires special training and has a special balked landing procedure. CAL wrote: what about part 91? Exactly what are you asking about part 91? I don't care if you are operating it commercially or privately, that aircraft and those pilots (lack of experience on type) had no business being there shooting that approach or even landing with those tailwinds on that runway in Aspen. Take into consideration that the Challenger uses flap 30 to maneuver in a circling approach with a minimum indicated airspeed of 150 kts and at the circling/landing altitude in Aspen its true airspeed was most likely in a CAT D category and then add the 30 to 40 kts tailwind and at some point during the approach they were probably grounding close to if not just over 200 kts. Again, even in a no wind situation, a circling approach with a Challenger in Aspen IMO is illegal.